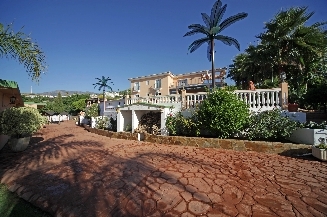 This is a truly breathtaking property situated in the tranquil hills of Benalmadena. The 6 bedroom Villa sits on a 5600m2 plot and has two lounges of 60m2 each. A large kitchen, 4 bathrooms, terrace for outside dining, a fantastic pool surrounded by ample terrace space with sea views and a pergola with a bar. The land also includes tropical gardens. an orchard growing bananas, oranges, peaches, figs, grapes, lemons etc. A padel court a second pergola, and what can only be described as its own club house. Complete with an opening licence from the town hall this clubhouse has its own working kitchen, bar and can easily accomodate 100 guests. Unlimitied car space. a seperate entrance for gardeners and staff, the place is alarmed and has the most upto date security system available. And has been significantly reduced in price. This place must be seen in order to truly appreciate its beauty,space and how it blends in with its natural surroundings. Views: Countryside, Lemon Groves, Mountains, Orange Groves, Sea. Features 24 hrs Security System, Air Conditioning Hot/Cold, Alarm System, Almond trees, Automatic Irrigation System, Balcony, Charming Property, Close to all Amenities, Commercial Kitchen, Country, Courtyard, Covered Terrace, Detached Villa, Dining Room with Fireplace, Electric Gates, En suite bathroom, Fireplace, Fitted Kitchen, Fitted Wardrobes, Fruit Trees, Full of Character, Garage, Garden, High Ceilings, Landscaped Gardens, Large Storeroom, Living room with dining area, Living room with fireplace, Many Special Features, Mountain View, Olive trees, Orchard, Outbuildings, Paddle Tennis, Picturesque Garden, Prestige Property, Private pool, Quiet Location, Sea Views, Subtropical Gardens, Terrace, Video Cameras, Water Deposit.